Adopting a child can be a priceless experience. The adoption process, however, can be a costly one. Adoption costs for things such as home studies, medical exams, and legal counsel can vary greatly depending on the type of adoption you choose. Adoption costs can range from $2,500 or less for foster care adoptions1 to $40,0002 or more for foreign adoptions. That’s why your budget should be an important factor in your adoption process. In 2016, more than 100,000 U.S. children3 were waiting to be adopted through state foster care agencies. While infants are occasionally offered through foster care, a majority of the children in foster care are older and may come with special needs or circumstances, such as a requirement to keep siblings together as part of an adoption. Foster care adoptions are typically the least expensive option. Adoption costs can range from $0 (thanks to reimbursable or waived expenses) to $2,5001. Public foster care agencies may often waive home study costs. Court costs and legal fees can also be reimbursed. Depending upon family income, adoption tax credits may be available to help defray additional adoption expenses. Choosing to adopt a child can be an emotional process. Private adoption agencies specialize in pairing families with birth mothers. Because they’ve worked with hundreds (if not thousands) of families in similar situations, they may very well be in an ideal position to understand the questions, concerns, and challenges that can arise during the adoption process. Fees for private agencies generally fall between $5,000 and $40,0001. These adoption costs can include home study expenses, birth parent counseling, adoptive parent preparation and training, and social work services needed to match a child to a prospective family. When working with a private adoption agency, be sure to get a clear listing of its services. Many agencies offer the ability to pay in installments, tied to certain benchmarks within the process. Knowing when certain fees are due can help you budget. It’s not uncommon for adoptive families and birth mothers to find each other without the help of an agency. In these situations, an attorney usually works with the adoptive and birth parents to develop an appropriate schedule to pay for medical and other expenses. Another consideration in independent adoptions is that costs may not be reimbursable if the birth mother changes her mind and chooses to raise the child instead. Adoption costs can vary widely depending upon the country you decide to adopt from. 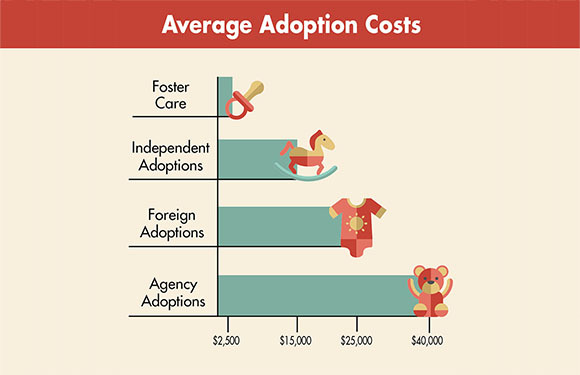 Recent foreign adoption cost estimates averaged between $20,000 and $40,000.2 Those estimates included the expenses listed above but requirements for prospective parents to travel to the foreign country and stay for an extended period of time could inflate fees. In addition, charges from the foreign country can also have a significant impact. I Know I Want To Adopt: Now How Do I Pay For It? Many companies offer adoption benefits for their employees. A good first step: Check if your company’s human resources department offers adoption benefits. With adoption costs that can approach $40,000, you may need an additional resource to help you take care of bills that can spring up. Discover Personal loans, available up to $35,000, are an option for financing an adoption. With fixed rates and various repayment timelines, some soon-to-be parents may prefer a personal loan to help with both predictable and unexpected adoption costs. No matter how you choose to finance your adoption, the journey will be a priceless experience.